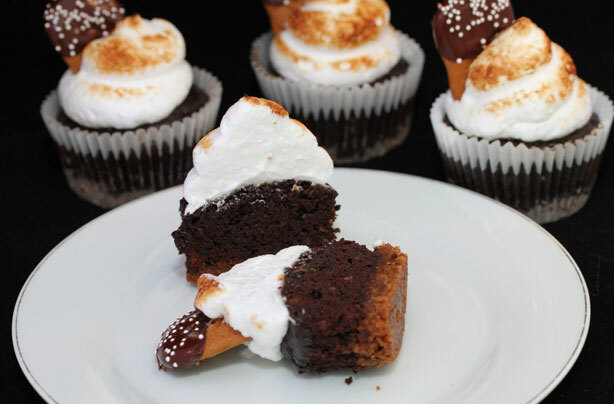 These delicious s’mores cupcakes are the perfect autumn treat. Based on the traditonal American classic, these cupcakes have four mouth-watering layers including a crunchy caramelised biscuit base, a layer of melted chocolate, a gooey rich chocolate sponge centre and a sweet, fluffy marshmallow topping and come complete with a chocolate dipped biscuit – what more could you ask for? To make this cupcake recipe, preheat the oven to 160°C/320°F/Gas Mark 3. Place your paper cases in the deep muffin pan. Starting with the base, crush the biscuits by placing them into a large food bag and rolling over the bag with a rolling pin. Melt the butter in the microwave on high for 30 seconds and mix into the biscuit crumb. Add a spoon of crumb to the base of each paper case and push down with the bottom of a small glass. Add the chocolate chips to the top of the bicuit and bake in your preheated oven for 5 mins. To make the cakes, sieve the dry ingredients into a large bowl, then add all other ingredients and beat until smooth. Remove the biscuit bases from the oven and divide the mixture between the 10 cases and bake for 25 mins then remove and cool. Leave the cake in the tins for 10 mins before popping on a wire rack. In a small pan heat the sugar and water, stirring constantly until the sugar has dissolved. Using a stand mixer if you have one, add the egg whites, salt and cream of tartar to the bowl and whisk until you have soft peaks. Keeping on a medium speed and dribble in the hot sugar syrup and beat for about 5 mins until you have stiff peaks of marshmallow. Add to a piping bag and pipe onto the cakes immediately. Toast lightly with a baking blow torch or by popping under the grill for a couple of mins. Melt 50g of dark chocolate in the microwave on short 20 second burst until it smooth. Break 5 caramalised biscuits in half and dip them into the melted chocolate, then sprinkle with white sprinkles. Add by pushing the biscuit into the marshmallow. If you're using a blow torch be careful not to burn the cupcake cases!